Thanks to a mild winter, Israel doesn’t experience the holiday season like other countries. Christmas is never white and you won’t find massive lighting decorating the main streets. However, this doesn’t mean that the holiday season in Israel is any less exciting. With Hanukkah and Christmas usually falling within the same couple of weeks in December, there are multiple events around the country to please even the most hardened Grinch. Unlike Christmas, Hanukkah is celebrated for eight days to commemorate the miraculous burning of oil on the ancient temple’s menorah for eight days when there was only enough oil for one. Therefore, you will find exciting events happening on all nights of the holiday. The Old City of Jerusalem is always spectacular to visit, but the festival of lights makes it an even more special experience with all the lit Menorahs around the city. 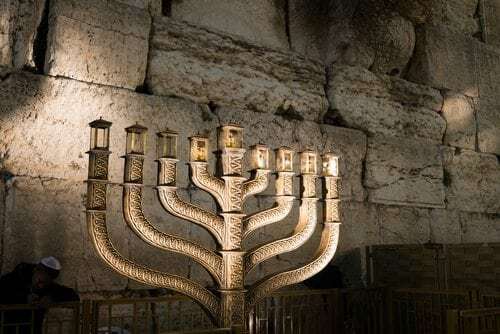 Visit the Western Wall on any night of Hanukkah to take part in the lighting of the 2-meter-high bronzed Menorah. Lighting takes place every night of the holiday at 4:30pm, except for Friday at 3:30pm and Saturday at 7:00pm. If you’re in the north, make sure to stop by Haifa for any of the Holiday of Holidays events taking place throughout the month of December. Go to discover different cultural events surrounding the major holidays of Hanukkah, Christmas, and Ramadan. There are different concerts, exhibits, shows, and antique fairs to keep you busy for even longer than eight days! Even farther north in the scenic city of Safed, you will find events for the whole family during Hanukkah, many of them focusing on artistic, historical, and religious activities. Check out their calendar of events for more details. 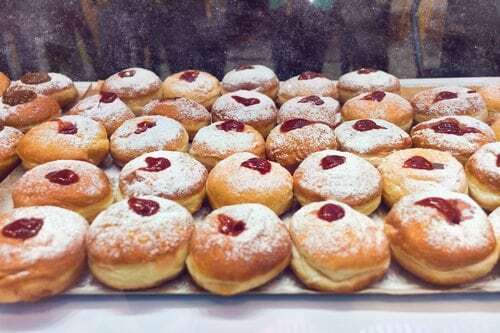 Make sure to stop by any of the bakeries around the country to sample some mouth-watering sufganiot (donuts). Get the classic jelly-stuffed donut or opt for a fancier version topped with chocolates, nuts, candy, or anything else the master bakers have come up with this season! If you’re in Tel Aviv and want to get into the spirit of the holiday, you don’t need to trek all the way to the capital; celebrate Hanukkah like a local and light the menorah in Gan Ha’atzmaut (Independence Park). For those wishing to experience Christmas in Israel, there are still many unique options for you too! Head over to Bethlehem for the famous Christmas Eve Midnight Mass at the Church of the Nativity. Get the full experience of the birthplace of Jesus by joining our Christmas Eve tour, which includes an unforgettable Christmas Feast! If you’re in Nazareth, there will be special events all month in preparation for Christmas. Stop by the Christmas Market for a street fair and the lighting of the Christmas tree between December 17th – 22nd. You can also go and watch the Christmas Parade on December 23rd, starting at 3:00pm. Take part in a special Christmas Mass at the Basilica of Annunciation on December 24th, or visit any of the Catholic churches during the evening of December 25th. While Jaffa is magical year round, it is even more of a special visit around Christmas time. Since Jaffa is home to Jews, Muslims, and Christians alike, the meandering alleyways of this old city are decked out with lights, menorahs, and Christmas trees. 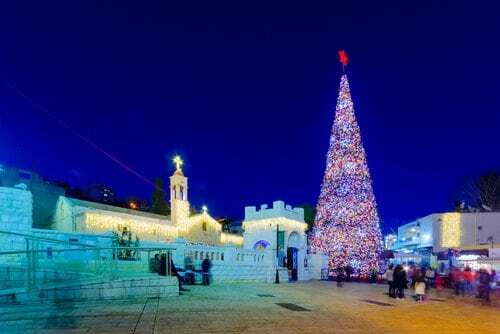 The official lighting of the Tel Aviv-Jaffa Christmas tree is on December 17th and 6:00pm at the Clock Tower. Interested in celebrating Christmas in the Holy Land? Don’t miss out on our exclusive Christmas Eve tour!